Looking for something fun for your children to play at the museum that will help them learn more about the museum and displays? Then try this free printable museum scavenger hunt. It’s a fun way to discover more about the museum and a great opportunity to closely examine some displays that you may have been passing by. What’s your favorite area of the museum? Did it make it onto this free printable game? Remember – don’t touch anything you aren’t supposed to at the museum! Most of the items on this list you’ll just have to point at and write down. 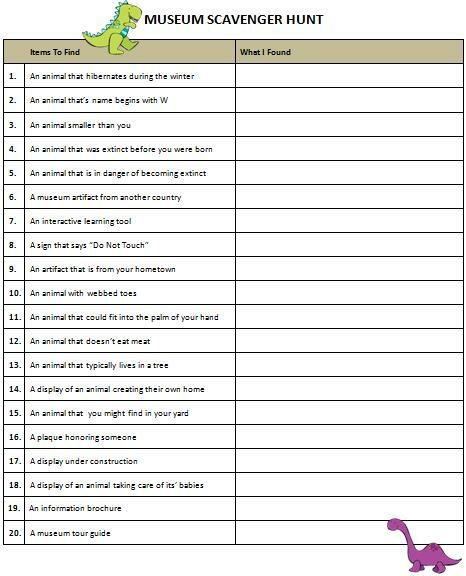 For more fun & free printable game ideas, visit our Printable Games page. We have loads of freebies to share with you like scavenger hunts, word searches, word scrambles, charades, BINGO cards and more. You can also find us on Facebook, Twitter, Pinterest or our new RSS feed Bloglovin’. Follow along to stay updated on the latest ideas for family fun. omg I am soo happy I have found you via the hop!! I am always looking for new GREAT things to do with the kids as I run an in home childcare!! thanks a bunch I will have to plan our next visit to the museum asap!! Thanks for stopping by! Good luck with the home childcare – I’m sure you’ll have a lot of fun with it! What a great idea. Seriousyl easy, but that would definitely keep them occupied. Stopping in from the UBP12. So glad I did. This is just what I was looking for! Thanks for posting! Will help our McKinley Museum (in Canton OH) be a little more interesting today! Thank you so much for your comment, Erin! I hope you guys had a fun time!